We thank you for your business and want you to know that we value you as our customer. How do I become a Pegasus VIP? It’s simple. When you register for a Pegasus live seminar or view a complete eCourse, you are automatically enrolled in the VIP Program. 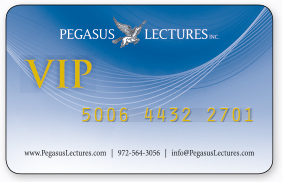 As part of your course registration, you will receive your Pegasus VIP card. Your VIP number is unique and will be issued after seminar payment is received. I attended a Pegasus seminar in the past. Do I qualify for the VIP discounts? Yes. If you attended a Pegasus registry review seminar in the past, you qualify for the VIP program. Contact our office by telephone at 972.564.3056 or email info@pegasuslectures.com for verification of seminar attendance. We will immediately apply your VIP discount to your order and send your VIP card via U.S. mail. In addition to significant discounts on Pegasus products, VIP customers receive early notification of free CME offerings and new product releases. How do I use my VIP card? Just type the VIP number in at checkout online to receive discounts on Pegasus products and seminars. If you are ordering over the phone or by mail, simply indicate that you are a VIP member by noting your VIP number. Your discounts will be applied at the conclusion of your order. Questions? Call our office at 972.564.3056 or email info@pegasuslectures.com.